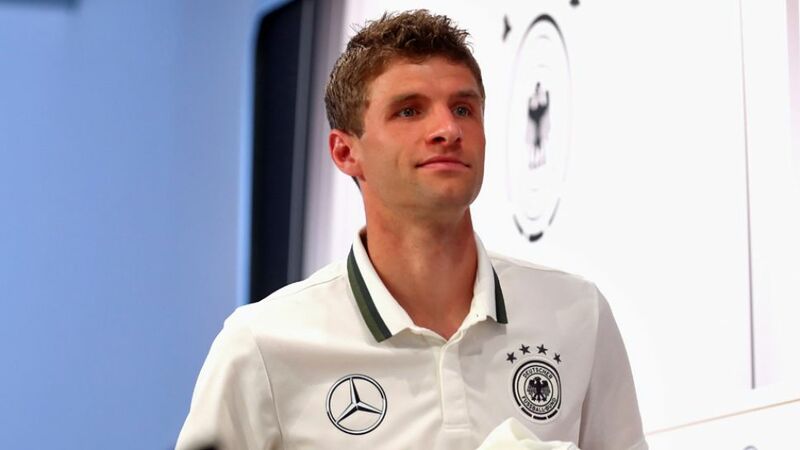 FC Bayern München forward Thomas Müller says victory takes precedence over his own goal-scoring fortunes when Germany take on Northern Ireland in Paris on Tuesday (kick-off:18:00CEST/16:00GMT). The 26-year-old has never scored at a European Championships, but insists his focus is purely on helping the world champions reach the knockout rounds - preferably as Group C winners. Müller is not the only one struggling for goals. After beating Ukraine 2-0 in their opening fixture, Germany drew a blank against Robert Lewandowski's Poland. The two nations are now locked on four points in positions one and two, acutely aware that whoever finishes top will, in all likelihood, receive a more favourable draw in the Round of 16. "There are so many permutations," Müller continued. "It's never been the case that a team simply breezes past the opposition in their group. We've not had as much joy in attack as we'd have liked. Forwards are expected to score, but that hasn't happened so far. We're the favourites and we want to win the game, but we can't guarantee it." New Bayern defender Mats Hummels is expected to start after coming through the Poland game unscathed following injury, but Germany assistant coach Thomas Schneider has intimated there could be changes elsewhere, with FC Schalke 04 sensation and major tournament newcomer Leroy Sane a viable option in attack. "We need every player we've got, so there could be one or two changes" revealed Joachim Löw's no.2. "Leroy [Sane] has done really well in training just like everyone else - maybe he'll play at some point. We've also tried a few things out with Thomas Müller, but we'll have to see where he plays tomorrow. We want to win the match and qualify as group winners."